With almost everyone today turning to plastic either in the form of credit or debit cards to pay all their bills and purchase the things they want, checks have become almost obsolete. However, there are still a few of us old fashioned enough to use checks and checkbooks on at least an infrequent basis. If you know someone on your shopping list that still uses checks, what would make a better gift than finding the best checkbook wallet and cover? So, here are a few of the best checkbook wallets and covers we could find. 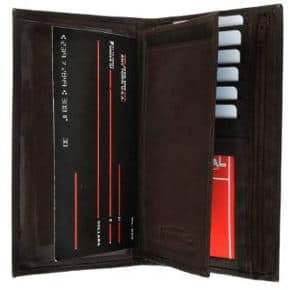 This Le’aokuu Men´s genuine leather bifold wallet organizer checkbook card case will allow you to carry your checks, ID, cards and even cash with you wherever you go. The Id window pocket with card slots easily slides out of the wallet and can be carried separately if you don’t need your checkbook or cash. This wallet is lightweight and doesn’t feel bulky when carrying it in your pocket. It has plastic dividers for duplicate checks, 4+ credit card slots and a pocket with a clear ID window. Also, an internal zippered compartment to keep your cash safe. There are two longer pockets for storing receipts and helping you keep organized and an external zip closure. This checkbook wallet is made in India of 100% genuine leather and measures 6.5” X 3.75” X 0.75.” It has 8 card slots and a compartment for keeping your cash and holding around 30 some bills. 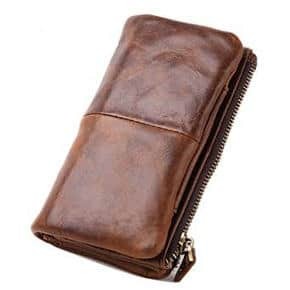 Users find that the length of this wallet makes it perfect for people who want to carry their wallet in their front pocket. They also say it is quite durable although when fully loaded, it does seem to be a bit thick due to the card slots being in the center. 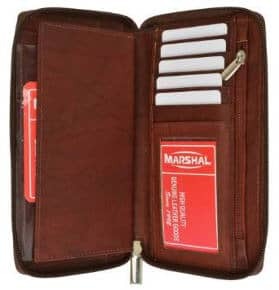 This Handcrafted leather wallet is manufactured by Marshal. It measures 6.5” X 3.5” and is made of beautiful soft leather with a soft material lining. It will accommodate side tear checkbooks and there is a place for a pen as well as clear slots for your credit and other necessary cards. This is a very basic checkbook cover made for those on a budget who want a durable cover for their checkbooks. The Le’aokuu Men´s genuine leather vintage wallet organizer checkbook card cover comes in brown, light brown or black and measures 7” X 3.5” X 1”. It contains a pocket with an ID window, card slots for keeping your credit, medical or gas cards as well as a section to cash and even a snap in coin carrier. Users find that this product is large enough to hold a smart phone so you can carry all of your necessities with you in one wallet. 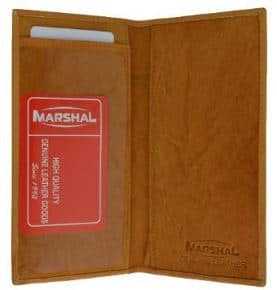 This Marshall leather checkbook cover wallet organizer with credit card holder allows people to carry their checkbook, credit cards and cash altogether. 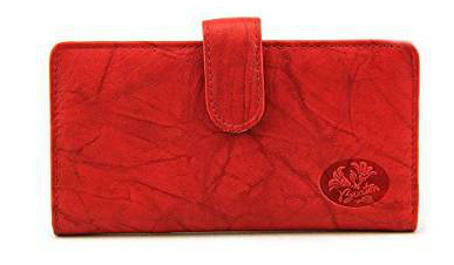 It has space for your checkbook that is felt lined, 7 card slots and a pocket with an ID window. 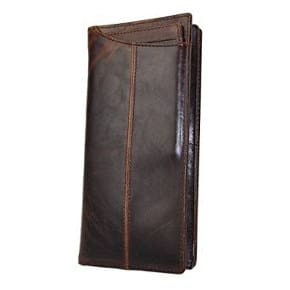 There is a zipper compartment for you to store your cash in and it comes in 4 great colors brown, black, burgundy and tan. Designed for women with some nice feminine details, this Buxton Leather Heiress Tab Checkbook cover and credit card holder is a nice looking wallet that comes in red, black, mahogany, pink, tobacco, Taupe, and even in black with an RFED protected version. There is a plastic insert to hold cards and a plastic check divider for your carbons. Also, a pocket with an ID window and a pen holder. It measures 6.5” X 3.5” X 0.75 and has an exterior zipper to keep everything neatly inside. 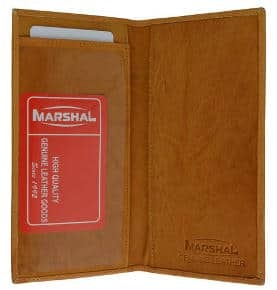 The Marshall basic leather checkbook cover measures 7” X 7.” It offers 11 card slots and a plastic insert for duplicate checks. It comes in 4 colors (tan, black, burgundy and brown) and while it is not made from premium leather, the leather is of good quality. This cover is durable and looks professional without having to have all the bells and whistles. As long as there are people who use checks, there will be people in need of a good checkbook cover, so one of these good checkbook wallet and covers may well make a great gift for those who still write checks.